Abu Dhabi: The UAE leaders are devoting much attention to the promotion of religious tolerance and freedom of worship, Archbishop Nathaniel, Patriarchal-Vicar for the Arabian Gulf of the Syrian Patriarchate of Antioch and All the East of the Syrian Orthodox Church, has said. 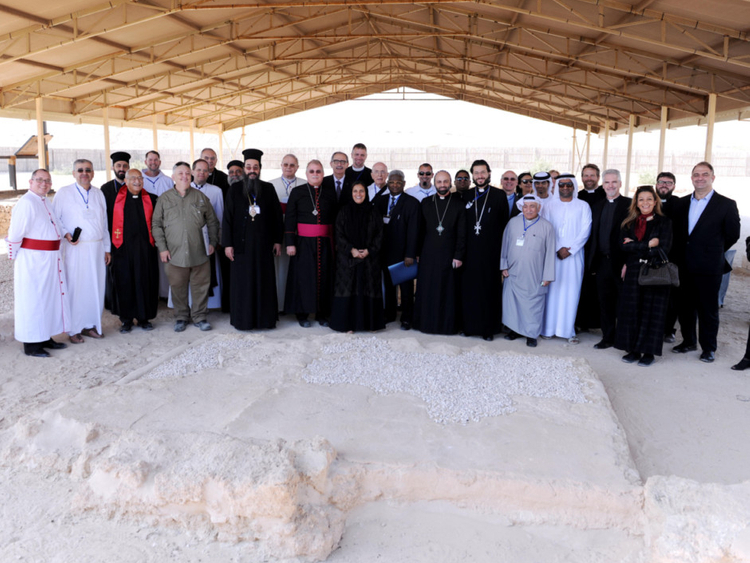 Archbishop Nathaniel made these remarks in the presence of Shaikha Lubna Al Qasimi, Minister of State for Tolerance, and around 30 Christian leaders from the Gulf while visiting the site of the early Christian monastery on Abu Dhabi’s western island of Sir Bani Yas on Tuesday. The visit was the first part of a day of discussions on ways in which Christian communities in the emirates can contribute to the promotion of the UAE government’s Tolerance Agenda. “We greatly appreciate the opportunity to visit this important site,” Archbishop Nathaniel added. “Not only does it provide evidence of the presence of Christianity in the UAE just before and during the early years of Islam, but the way in which the leaders of the UAE are devoting so much attention to its excavation and conservation is testimony to the way in which they, and the whole of the UAE, are devoted to the promotion of religious tolerance and freedom of worship today.” he further said. The clergymen, including several archbishops and bishops, were drawn from a total of nine different denominations, including the Roman Catholic Church, the Anglican Church, the Evangelical Church, the Reformed Church in America, the Coptic and Greek Orthodox Churches, the Mar Thoma Church, the Armenian Orthodox Church and the Syrian Orthodox Church. “This site is a symbol of the diversity we have in the UAE,” Shaikha Lubna told the visitors. “Nations develop and flourish when they accept differences and work on their similarities. “The emphasis being placed on this site is evidence of the commitment of the UAE towards its archaeology and history, particularly for sites such as this which represent our values of tolerance, coexistence and peace,” she added. Earlier, speaking to the participants in the annual meeting of the Gulf Christian Fellowship (GCF) at Sir Bani Yas in Abu Dhabi, Shaikha Lubna outlined the pillars of the country’s philosophy of tolerance, which is part of the National Programme for Tolerance. “It was built on a combination of Islamic faith, UAE Constitution, the legacy of the country’s founding father, the late Shaikh Zayed Bin Sultan Al Nahyan, and the ethics that underpin UAE society,” she said. “As we work in the emirates to promote our commitment to, and understanding of, the philosophy of tolerance in all walks of life, we encourage those from expatriate communities, of all origins and beliefs, to play their part in helping us strengthen our tolerant society,” Shaikha Lubna said. She invited leaders of the country’s Christian communities to play their part in contributing to the promotion of the country’s recently announced National Programme for Tolerance. Bishop Paul Hinder, Vicar Apostolic for the UAE, Oman and Yemen for the Catholic Church, thanked Shaikha Lubna for the meeting and the visit to the monastery. He said the discovery of the Christian monastery at Sir Bani Yas “reminds us that Christianity was present in the region very early and coexisted with Islam for a long period. This is a strong sign for what is again happening in recent times, thanks to the open-minded rulers of the UAE”. Archbishop Makarios, the Greek Orthodox Archbishop of Qatar, said the GCF was “encouraged and enthusiastic about the steps that the UAE National Programme for Tolerance has taken towards promoting ethics and human values in terms of religious coexistence, in particular, its recognition of Christian heritage in this region and giving it its rightful place in the historical narrative”. The site of the monastery was first identified in 1992 during a survey undertaken by the Abu Dhabi Islands Archaeological Survey (ADIAS) on the instructions of the UAE founder and former President, the late Shaikh Zayed Bin Sultan Al Nahyan. Studies of the finds from the excavations as well as other research suggest that the Sir Bani Yas church and monastery may have been founded sometime in the early to mid-7th Century AD, at a time when, prior to the coming of Islam, Christianity was present throughout eastern Arabia. Although there is evidence in ancient documents of the historical presence of Christianity in the UAE, the Sir Bani Yas monastery is, so far, the first physical evidence to have been discovered. It is believed to have been part of a network of churches and monasteries spread throughout the Arabian Gulf at the time, with other sites having been found in Kuwait (Akaz and Al Qusur on Failaka Island), Saudi Arabia (Jubail) and Iran (Kharg Island). During the excavations at the Sir Bani Yas site, finds of particular importance were a number of plaster friezes that would formerly have decorated the church. Studies suggest that these date back to the mid-7th to 8th Century AD. The weathered surface of some of the pieces indicates they were used externally on the building although others were probably used inside the church. Some pieces have Christian crosses on them while others depict flowing scrolls connecting palm leaves and grapes. Decorations of this type are known to belong to the architectural style of the Church of the East, one of the Eastern group of churches.